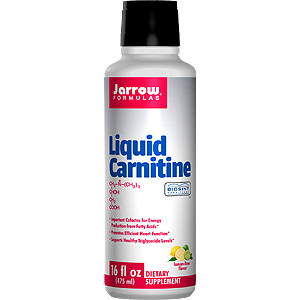 L-Carnitine is essential for the production of energy from fatty acids by virtue of its role in the transport of fatty acids into the mitochondria where energy is produced in a process called fatty acid oxidation. L-Carnitine enhances the rate of ATP production (also called oxidative phosphorylation) which is a key step in energy production throughout the body. By enhancing fatty acid oxidation, carnitine can reduce triglyceride levels. Major body tissues, particularly the heart and skeletal muscles, depend on fatty acid oxidation as their primary source of energy. L-Carnitine helps regulate the rhythm of the heartbeat. L-Carnitine is also involved in sperm motility. L-Carnitine is a vitamin-like molecule produced in the body from the essential amino acids lysine and methionine. One gram of L-Carnitine is equivalent to the amount of carnitine found in 3.5 lbs of steak. Pantothenic Acid (Vitamin B5) is also involved in the transport of fatty acids into the mitochondria. Take one to two tablespoons daily on an empty stomach, or as directed by your qualified health consultant. Store in a cool, dry place. Other Ingredients: Purified water, vegetable glycerine, natural vanilla flavor, grapefruit seed extract and potassium sorbate (a preservative). Liquid L-Carnitine 1000 - is shipped in a discrete, unmarked package. Orders are processed immediately and usually take about 3 to 5 working days to be received. We do ask that you try it for 2 to 3 weeks to feel the full effects. Any information received is used only for order processing and shipping purposes. Your information, such as e-mail address, will never be disclosed to a third party.